ABC’s live action series Batman was anything but a hit when it originally aired on CBS from 1966 to 1968. The series, which starred Adam West in the role of Bruce Wayne/Batman lasted all of three seasons in its original run. Since its cancellation, it has become a cult hit with audiences of all ages. It has run on syndication on a number of networks and is currently running on Me-TV every Saturday night at 7pm ET. Throughout all the years that it has been on television since its cancellation, it has not received a proper release on DVD or Blu-ray. That is until this year. Warner Home Video and FOX released the first season of the cult favorite last month alongside the show’s full series box set. The complete box set is rather pricy both on DVD and Blu-ray. That means that most fans of this hit series will be more interested in picking up the complete first season box set. Batman: The Complete First Season boasts plenty of positives. But it also has its own hare of negatives that can’t be ignored, either. On the positive end, audiences will appreciate the fact that every Season One episode is presented here. So audiences weren’t short-changed there. What’s more, every one of the episodes is presented exactly as they originally aired on ABC so many years ago. And rather than make each half of each episode a separate episode, they are each presented as one full episode. Of course for every positive, there is a negative. This recent release is no exception to that rule. The people at WHV got the issue of the episodes one hundred percent right. In terms of the bonus material though, both companies struck out swinging. Batman: The Complete First Season comes with no bonus material to compliment the episodes. The bonus material has all been saved for the full-series box sets. WHV and FOX try to entice audiences into buying one of the two boxes by including a coupon for ten dollars off of either the Blu-ray or DVD series set. That is not a positive by any means and will be discussed at more length later. As glaring as the noted negative in question proves to be, audiences can at least be happy about the presentation of the episodes. The footage looks wonderful in its transfer to DVD. And each episode is presented in full 16:9 format rather than the 4:3 in which most classic series were presented. It is one more way in which Batman: The Complete First Season impresses with this its debut DVD release. It’s just too bad that it wasn’t released on Blu-ray. Maybe audiences would have had the option of at least some bonuses in a Blu-ray box set. A fan can dream, right? Right. That aside, the end result of these positives and negatives is a box set that while anything but perfect, is still a good addition to any Batman fan’s home library. There is a lot to like and just as much to not like in the debut release of Batman: The Complete First Season as should be clear by now. Luckily for fans, the positives far outweigh the negatives, beginning with the episodes themselves. Audiences that are familiar with Batman will recall that within the context of this series, each episode was split into two parts. While the series only ran for three seasons, this made the show really last. It was a formula that made audiences want to tune in from week to week. The people at WHV and FOX have paid proper tribute to that formula–and the fans of the show that lived week to week by the formula–by combining both halves of every Season One episode into one complete episode. It would have been just as easy to spread out each half of each episode and call them “episodes.” That would have been purely deceptive marketing as it would have meant both companies trying to fool audiences into thinking there was more than really was there. Luckily they didn’t go that route. And for that reason alone, WHV and FOX are deserving of at least some credit. It’s at least one reason to applaud the debut release of Batman: The Complete First Season. 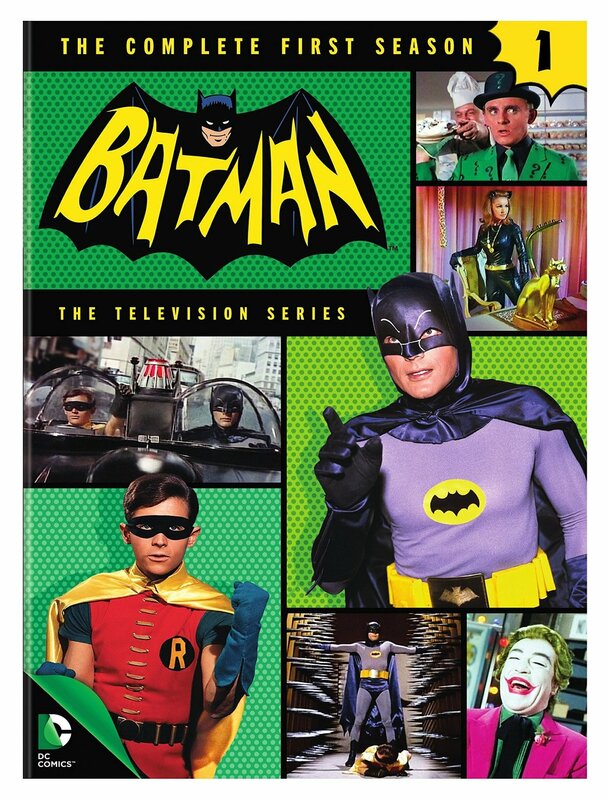 The presentation of Season One’s episodes is by itself plenty of reason for audiences to applaud the debut release of Batman: The Complete First Season. But as anyone knows, for every positive there is a negative; a yang for every yin so to speak. And this box set is no exception. Audiences will be displeased to discover that while WHV and FOX have included every episode from Batman’s first season in this box, they have clearly omitted any bonus material at all. All of the bonus material has been saved for both the Blu-ray and DVD presentation of the show’s complete series boxes. In turn, WHV and FOX have included in Batman: The Complete First Season a coupon for ten dollars off the purchase of either the Blu-ray or DVD full series set. This is hardly a positive. And here is the reason why: Audiences that actually would use the coupon would still pay nearly $150 for the DVD box set. They would still be paying well over $200 for the Blu-ray set. Keep in mind that 20th Century Fox was able to release its complete series run of Futurama in a single box for under $100 on DVD. There is no Blu-ray option there. That is about seven or eight seasons. So how can 20th Century Fox do that, yet WHV and FOX expect people to shell out exorbitant amounts of money for a three-season box set by comparison? This is a losing situation for fans who have waited decades for Batman to finally receive a proper release on DVD or Blu-ray. It is an insult to those same fans. WHV and FOX should be ashamed of themselves for this. Keeping that in mind, it knocks off major points for Batman: The Complete First Season and for both of the full series sets. Still not enough to consider? How about the fact that WHV is looking to split up the second season of Batman into two separate volumes beginning in February 2015? That’s right. What this means is the possibility of WHV doing the same thing with Season 3. That means that Season One could be the only one that audiences and long-time fans see in a single set. It’s probably the only factor that would even begin to make purchasing either the Blu-ray or DVD full series set more worth the purchase than Season One. It doesn’t make such practice any more ethical, regardless. Obviously, WHV isn’t the only company guilty of this practice. 20th Century Fox has done this with its home releases of Family Guy’s various seasons over the years. It’s a way to stretch things out and for WHV to make more money from audiences. That goes without saying. But the people at WHV know that people such as this critic will still shell out the money for it. It’s just a shameful practice regardless of the company releasing the box set. And it is something that had to be noted here if only or context. Now, having finished on the soap box, it’s time to turn back to the positive side of Batman: The Complete First Season. There is at least one more positive worth noting about this box set for fansto consider. That factor is the look of the episodes themselves. The footage looks surprisingly clean even on DVD. It shows that those charged with transferring the masters from tape to DVD and Blu-ray went to painstaking measures to insure the footage looked its best for fans. For that alone, WHV and FOX are to be applauded. Even more interesting about the episodes’ presentation is that each episode is presented in full 16:9 format rather than the 4:3 format in which so many shows of its era were presented. In sizing the resolution up to 16:9 none of the episodes’ quality was sacrificed. So it looks just as good as it did in its original broadcast format. Together with the fact that every one of Season One’s episodes are presented here in their entirety, it is one more positive that helps to perhaps not outweigh the negatives of the set but at least equal their weight. And in equalling the weight of the set’s negatives, it serves to make Batman: The Complete First Season a welcome addition to the library of of long-time Batman fan. It is hardly the best that WHV and FOX could have offered fans. But for those that can’t afford the unethically exorbitant cost of the full series sets, it is still a good piece to have. Thank you David S. Goyer. Thank you Christopher Nolan. And thank you Jonathan Nolan. Thanks to this trio, action film fans have gotten what is one of not only the best actions films of 2012, but one of the best films of 2012, hands down. And while it is an impressive movie, one can’t help but wonder if perhaps it would have been better served to have been split at least into one final movie instead of trying to cram the entire thing into a near three hour time span. That, perhaps, is the only true fault of this franchise closer……or is it the closer. For those who have yet to see The Dark Knight Rises, Goyer and the Nolanâ(TM)s leave the door somewhat ajar for the possibility of another movie, even if it isn’t helmed by either of the Nolans. What that means will not be given away, for the sake of those who have yet to experience this thrill ride of a story. The Dark Knight Rises is a fitting title for this third and final(?) movie in Christopher Nolan’s Batman franchise. What audiences see in this installment is Bruce wayne having had everything taken away. He even loses his fortune through a series of twists and turns written into the primary plot. That is one of the problems with the story’s writing. How he loses his money exactly won’t be given away, either, here. But the manner in which it is tied into the larger storyline is somewhat roundabout. But being that said instance happens, combined with another downfall of sorts (there’s a little hint there), it makes the movie’s title that much more of a fit. Audiences see Bruce Wayne AND Batman rise. There’s even homage to the comic storyline in which Bane broke Batman’s back. Of course, in that storyline, another character named Azrael had to take on the Batman mantle. That doesn’t happen here. As subtle as it was there was another factor that made The Dark Knight Rises an interesting movie. In the first fight scene between Batman and Bane, there is no music to heighten the mood of the moment. Typically, with any action movie, said music would be standard. But in this case, that fight scene in question as just as powerful without the music. That’s because audiences see just how tough Bane is. There’s no need for music to emphasize that he was one tough villain. The music is actually discussed in the bonus features in the new home release of The Dark Knight Rises. It’s just one of many bonus features that make the movie even better now that it is available on DVD and Blu-ray. Whether one is a trained movie production professional or simply has an appreciation for the work that goes into bringing such an epic movie to life, the extensive bonus features included in this release make for much more appreciation for the dedication to the Batman franchise. The only irony of the new home release of The Dark Knight Rises is the lack of commentary on the main disc with the movie. That isn’t entirely a loss though. Considering the extensive bonus features included in the set, the lack of commentary is a minor issue. Add in impressive quality footage in the Blu-ray presentation and audiences get a work that is not just one of the best movies of 2012 but also one of the best home releases of 2012. As previously noted, The Dark Knight Rises clocks in at nearly three hours in length. Goyer and the Nolans should be commended for making such an effort to bring everything from the first two movies and bring the whole franchise full circle. Even Dr. Crane (A.K.A. The Scarecrow) is back again. But because the trio made such an effort, it felt like too much was crammed into too little space. While most critics might have panned the men for doing it, since the Harry Potter franchise did the same thing,The Dark Knight Rises might have been even more of a joy had it been spread out into another movie. It would have left both the most seasoned Batman fans and the more casual ones feeling fulfilled while still wanting more. Instead, it obviously left some audiences feeling winded after such a wild ride. Regardless, what David S. Goyer and the Nolans have done for audiences with not just given this generation its definitive Batman, but it has clearly left the door open for Nolan or anyone else to continue the franchise in his or her own vision. Should that happen, here is to the hopes that whoever should take the reins next will bring audiences a Batman franchise as impressive as Nolan’s, AND Burton’s.